Flew from Berlin, via London, to Philly yesterday evening. Fell asleep in my own bed (it felt soooo good), only to wake up at 1:30 a.m. and still be awake at 12 noon today. The good news? I was able to put a major dent into playing "catch up" with my new television obsession ..."Scandal". Always fashionably late to the party. Yawn. I shocked the entire familial unit by NOT downloading and beginning to edit my photos upon my arrival home last night. Nope, held off til this morning. And only on the "download" part. Let's just say I took a few too many photos. The lighting conditions in Prague, Dresden and Berlin were not optimal, to put it lightly. Abundant fog, haze and clouds that resulted in washed out skies. My white balance was outta whack right along with me. Experimentation with camera settings = a whole sh*tload of photos. Altho amazingly, I STILL have not attained my goal of maxing out a memory card on a trip yet. So I despite my efforts, I apparently continue to be a classic underachiever. Had a trip of a lifetime with my mom and middle sister, glad to be back home, thrilled to finally be able to look at my photos, eager to drink a Diet Peach Snapple (cause I'm overloaded on bottled water/no gas), AND... happy to be back posting here. More to come once my camera stops smoking. Oh, those gray European skies...I remember them well! Can't wait to be treated to your stories and photos!! I loved seeing your adventures on IG!! Welcome home! Can't wait! It looked like an amazing trip on IG! Feel your jet lag pain and hope you get back to normal soon! Can't wait to see your photos. Prague is so beautiful! Great post! sounds like the jetlag has kicked in. So we will look forward to the photos of what sounds like you had a wonderful trip. Have a great weekend catching up. I am joining you over at Wednesday Around the World. By the way...what is the size of your card....I am sure you would have maxed out several smaller cards! Welcome home............look forward to seeing those pics. Nice photo of the fence. Good luck sifting through all your vacation pics. we saw locks all over the bridges in Paris too. We thought it an odd expression of love, but clearly lots of folks are taken with it. We were amused by the touts selling overpriced locks to tourists. 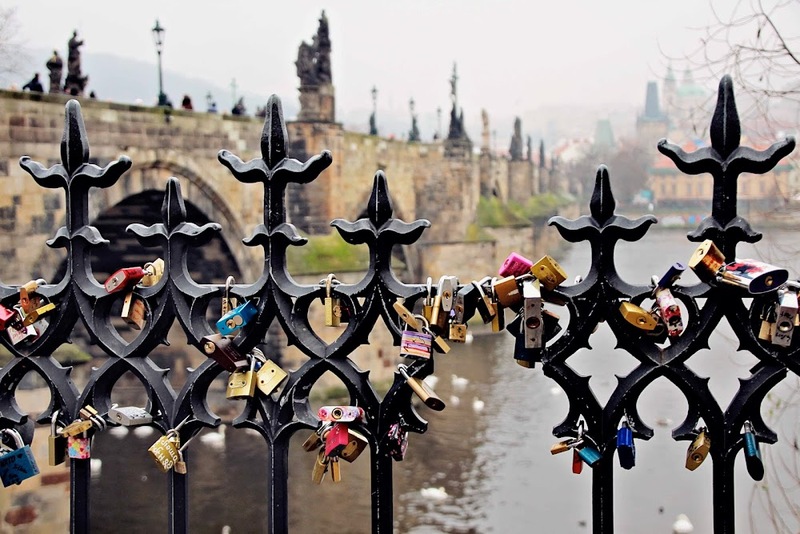 Wonder if Prague has lock touts, too. Kath, We visited Prague 10 or so years ago. It is where my fathers heritage is from. So gorgeous and I hope to return again! Love this photo! Can't wait to see more.